There’s subtle and mystical world beneath the gross one that we perceive via our senses. This creation of ours has certain laws; the “Law of Giving” is one of them. 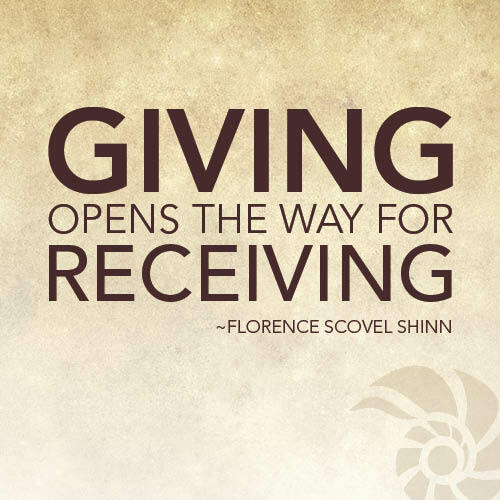 If we are to accumulate riches, we ought to harness the Power of Giving. It is super effective but takes time and some reflection to realise its full potential. In today’s rational world, it appears that if we give..we end up with less. Those who give, make it a part of financial planning/budget and donate anywhere from 1-10% of their income…which is fine; better than not giving at all. But we should try to go beyond this typical tradition of Giving. The ultimate goal should be to keep what we need for our maintenance and give away the rest. It helps to think that we’re not the Doers and avoid having “Proprietor/Controller” propensity. I recall my favourite stanza from daily prayer that we used to chant while growing up: “Tera tujhko arpan, Kya lage mera” means “Nothing is mine to begin with, I offer it back to you Lord..what do I got to lose”. Matter of fact, Giving is glorified by scriptures of all religions. Whatever we give, it comes back to us manyfold…there’s no doubt about it. 1) Waiting for the ideal day/time: Many keep waiting for that ideal day..when they will be comfortable financially. But it never happens, the needs keep growing. Best is to start as early as possible; now that you have a job and some income, start giving. It is a great experience for the young ones as well, involve them from day one. 2) Worrying whether the money is reaching the needy: This is the main concern that discourages many from giving liberally. I understand it is a valid issue but if you spend enough time doing your homework, you will find charities where each and every penny reaches the needy. Once you’re involved enough in giving, you will meet many who have taken to charity/Helping others fulltime..giving up the comfort of a family or a good career. Now giving can be in any form, not only in terms of money. We can donate our time, energy, skills..any of this can be used to help others. Somewhere I read: “the easiest way to get what you want is to help others get what they want.” This is so true. All I know: Nobody has gone broke Giving. Next time you think of becoming Successful or Rich, think how you can help others. This is a sure shot approach of becoming wealthy. This entry was posted in Become Successful on May 26, 2017 by admin.